Starting from the first moment, it is clear that project Shareholder IC is a huge budget project and apparently operated by a professional administration team. I'm happy to see it on DavidNews.com Golden Stage listing, and I reinvested into Shareholder IC $400. The project is not entirely fresh, but has been online for around five months and during this time, it has grown into a huge platform that connects investors from around the entire world. When we take a closer look at this project, it is clear that web page design has been made entirely just for this project and this project have one of the most professional promotional videos that I have seen around for a while. By the way - I recommend to watch it. Like website also, promotional video is translated into several languages. In Testimonials section, you will find feedback from investors and thing that I love the most is that much of this feedback is in video format, so you can check out what actual investors have to say or add to this project. On news section administration publish frequent updates, but from time to time administration hosts online webinars where host speaks about opportunities in the project and gives insight in the latest updates. Management of Shareholder IC is active on various social networks. Just in the Facebook group alone we can find more than 20 thousand members, and I believe that significant part of participants are actual members of Shareholder IC. The project also has 24/7 online support and phone support (I did not try to call them, but if you had, please post about your experience in the comment section). I find it interesting that you will accumulate profit every calendar day (note that profit each day will vary depending on purchased share) but withdrawal you can request only once per week - on Thursday. This rule is interesting just because it is a clever way how to keep more capital in the project and because of that it can last longer than a similar rival project. Two extra things - minimal withdrawal amount is 10 dollars and for each withdrawal, there is a small fee applied (check when you withdraw). Personally, I must declare that this is one of the most finished and the most potential projects that I have seen around for a very extended period and best of all I can tell only positive things about it. Of course, we can always find something wrong in the project, but Shareholder IC is a very professional project, and 95% other projects of industry is sill light years behind it. 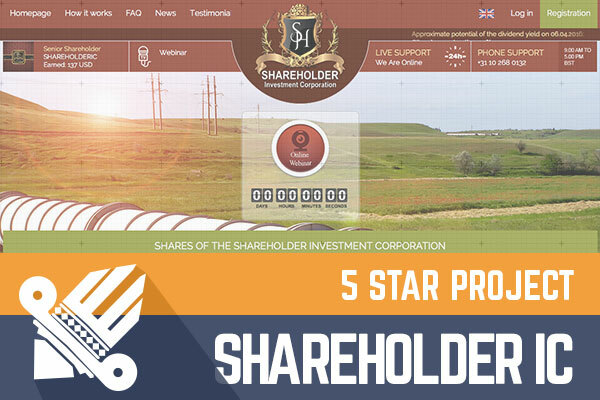 Shareholder IC is clear example how professional project should look like, and I hope that it will fulfil my expectations. Finally, I must add one last thing - remember that each project close some day and if you risk than only that you can afford to lose. My name is Jim Hogast. I'm from Holland. I am the head of a web studio that specializes in creating Internet services and investment projects. My team is very big. These are - designers, copywriters, web designers, system administrators, people who know many languages, advertising agents. We did the website ourselves, and did not buy anything. This is our first Company. We plan to cover the whole world and to work for many years. As you can be seen on Alexa, we go only up and developing fast http://www.alexa.com/siteinfo/shareholder.company . Every time we have a new update on the site. The site will be translated into all the languages of the world. LANDING, new pages will be added for all - for free. Very soon we will have the webinars in Italian and French. A friend of mine let me know about you, after reading your blog. I realized that you have a big team of true professionals! We believe that our project is at the top, so we took the best listing. Our investment plans are designed for the long term and with not particularly high percentage, in addition, to the end of the term of the deposit, it will be returned to the balances and the participants will be able to cash out or continue to cooperate with us. Due to this interest, we can work for a long time! OUR GOAL is making things work! OUR GOAL IS TO INVOLVE WHOLE WORLD IN HERE! OUR ADVERTISING IS EVERYWHERE! - Does the project have any hidden fees? Maybe the project has some special rules for withdrawal or deposit withdrawal? There are no anonymous payments. There are no such rules. Of course, our members get a bonus from the company to do advertising on Facebook and other social networks. In addition, we do SEO advertising. We have many groups in all social networks. - How safe is the script that your project uses and how safe is the server that your project is using? We do not have a hosting and virtual server. We have the best, excellent system administrators. We have our own physical server with excellent DDoS protection. We have already proven ourselves in many parts of the world. Moreover, many bloggers know our faces. We came to work honestly and for a long time! People, who are with us, will be happy to work with us. And will always get good profit, because our plans regarding this company are very huge. We plan to open many offices in many parts of the world! - If an investor has decided to invest in your project, is there something that one should know before making a deposit? First of all, he or she needs to consult with the sponsor / the upper standing investor. - How do you see your project in the future? This is the Company that has a lot of confidence and strength. And this is very important, I would say! Our motto is: Shareholder IC - your opportunity to your bright future!!! Money is not the most important, our goal is glory! If there is the glory, there will be the money! If you are trying to buy bitcoins online, PAXFUL is the ultimate source for bitcoins as it allows buying bitcoins by 100's of payment methods, such as MoneyGram, Western Union, PayPal, Credit Cards and even exchanging your gift cards for bitcoins. Ever try to maximize your free satoshi collections by utilizing a BTC FAUCET ROTATOR?